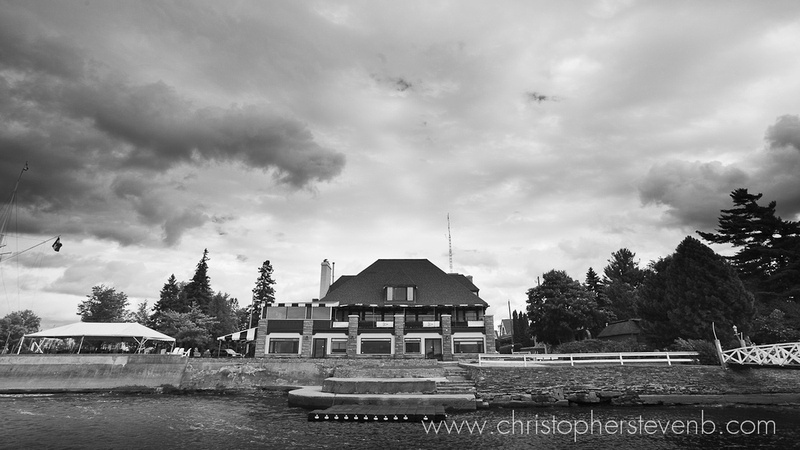 Ottawa Wedding Photographer Blog | Christopher Steven B. My Blog Has Moved ! One of the questions photographers wrestle with from time to time is how much to show. This question comes up not only during a shoot, but also during the process of creating a portfolio, sharing these photos. How much of our work should we, as photographers share ? I have seen some wedding photographers adopt a minimalist style: showcasing only the epic shots in a relatively small online portfolio. The advantage to this approach is that it helps project precisely what his or her vision is. But I think that an increasing number of wedding photographers are opting to showcase more of their work on the web. I'm definitely of the latter group, as evidenced not only by my portfolio site, but also by this: my blog, where I try to share something from each of my photography sessions, be they large or small. Ah, but lest you think I share a lot because I'm incredibly indecisive and have difficulties narrowing my work down (though this is undeniably true..), I have several other good reasons for doing so. When I share photos I feel like I'm giving back to the photographic community in some way. Just as seeing the work of other photographers has often served as inspiration for my own growth, hopefully some of my work has that effect on others. Because I share so many of my photos online, it's almost always the case that when I do get together with a client for the first time, we're inevitably on the same page style-wise. Setting up and then creating images that are epic or even other-worldly is one of my goals as a wedding photographer. Those are the photos that become framed pieces on your wall; those are the photos that define your wedding album. But my view is that these photos alone can't ever begin to capture the story of your day. My style places significant emphasis on the details, on the candid moments you probably didn't catch in what is often a whirlwind of a wedding day. In short, I show lots of images, because it is the only way to show what I do, and what I love to do. There is something about hotels that I really enjoy. Perhaps it is wandering through super symmetrical hallways or hovering in the lobby as if it is some giant communal living room. Ah, and perhaps it is my love for the movie The Shining. But Hallowe'en is over, right ? 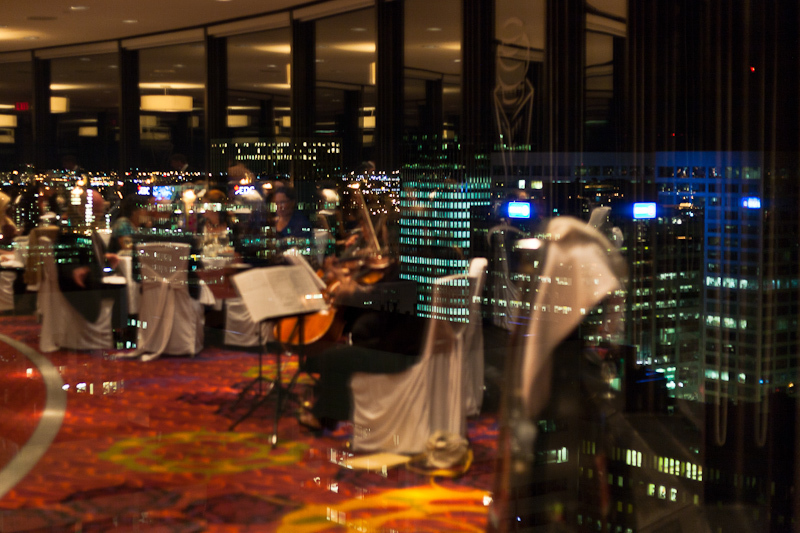 This wedding was my first at Ottawa's Marriott Hotel; and it was a particularly unique experience as both the ceremony and reception were held in the Sussex room: the rotating penthouse floor whose glass walls allow a slowly shifting panoramic view of downtown Ottawa. One other unique aspect of the occasion was that out of security concerns (clearly the ring bearer was a spy..), the couple requested that I not share photos that depict any of the guests or wedding party. As important as sharing my work is to me, I totally appreciated their obviously valid concern; and to be honest, I grew to like them so quickly that I was honored and excited to be a part of their special day. Here are a few photos from the day that I'm able to share. 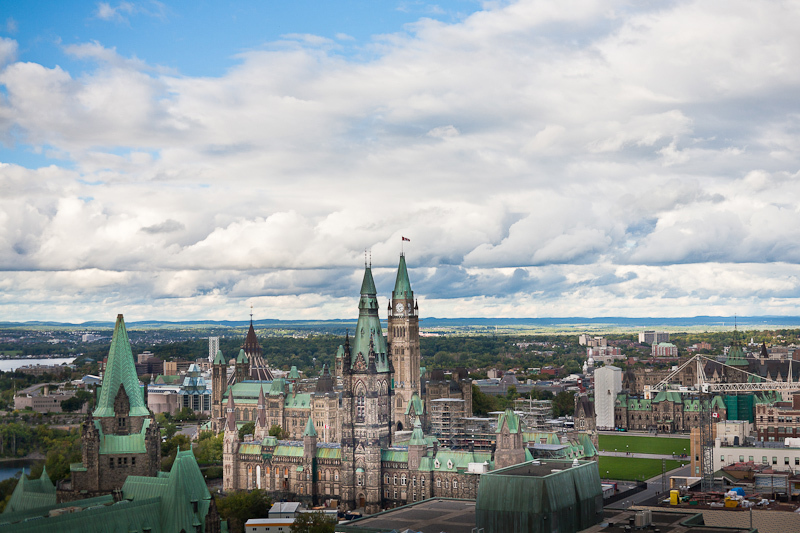 First up: a view of Parliament Hill as seen from a 21st floor room at the Marriott. 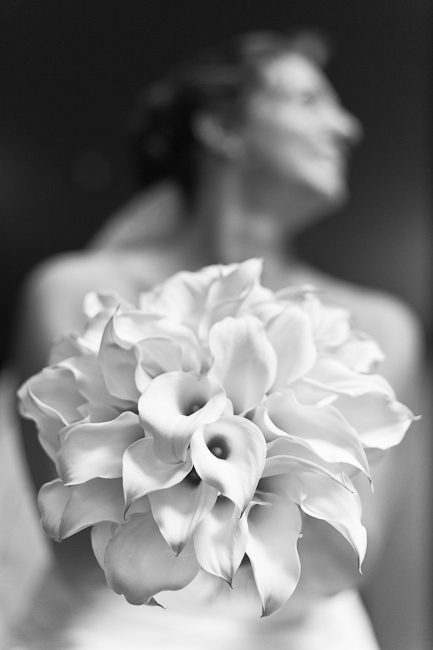 Below, the bride shows off her calla lily bouquet. Below is a little texture from the evening reception: a view of the Ottawa nightscape outside with window reflections of the party inside. 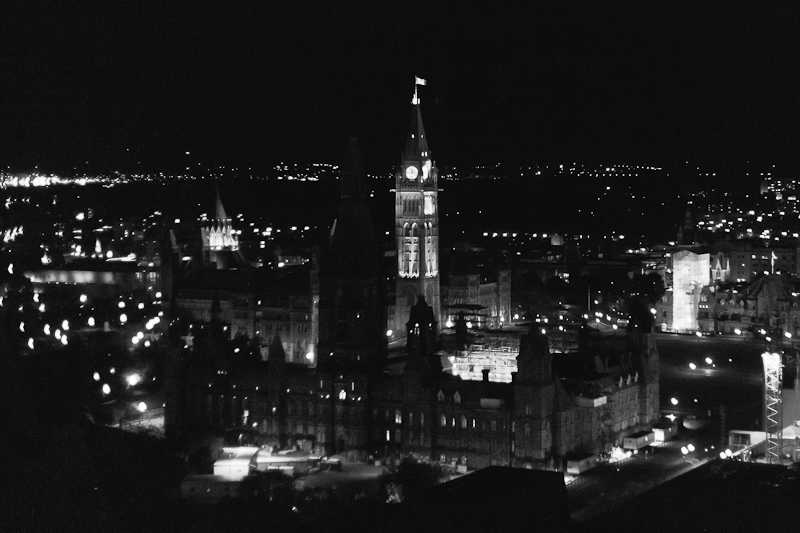 The last photo of the evening, photographed through the window of the Marriott's Sussex room: an evening photo of the Peace Tower at Parliament. As much as wedding photographers hate the rain, most of us love the drama present in the sky before and after a downfall. Strangely enough, the two weddings I shot at the Britannia Yacht Club last month both offered this drama. Gatineau Park / Wakefield Covered Bridge Wedding, Anyone ?